Verizon subscribers with the LG G Pad 8.3 are receiving a minor update that removes support for the Redbox Instant app. The streaming video service, a joint venture between Verizon and Redbox, closed its lights permanently in October. 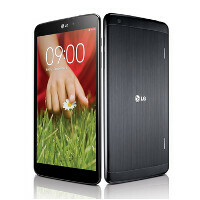 After the update, the LG G Pad 8.3 will support 4G LTE roaming in selected markets. And issues that users had with powering up the device have been fixed. The update brings software version VK81023A to the tablet, which has nothing to do with the hoped for Android 5.0 update. The tablet is a relative new comer to Verizon's lineup, having launched via Big Red starting on October 7th. The LG G Pad features an 8.3-inch glass with resolution of 1920 x 1200. That works out to a pixel density of 273ppi. A quad-core 1.7GHz Snapdragon 600 CPU is under the hood with 2GB of RAM and 16GB of native storage included. A 64GB capacity microSD slot is available for those who need additional storage. The back and front-facing cameras weigh in at 5MP and 1.3MP respectively, and a 4600mAh battery keeps the lights on. Android 4.2.2 is pre-installed on the slab. Heh, I'm still on 4.2. Not sure why I haven't updated to 4.4. Laziness, I guess. I probably won't go with Lollipop though, unless rovo89 manages Xposed to work with it. 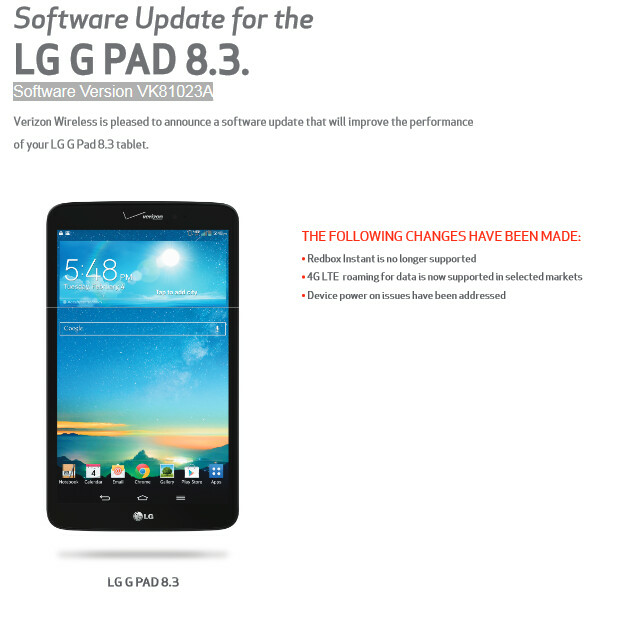 On a side note, why is the Verizon G Pad 8.3 neutered compared to the other versions? And why won't cases made for them work with Verizon's version? I'm on 4.4.2 on my gpad 8.3. My G3 has a nicer version of LG's UI. I'd love if they were the same experience. Neutered? My gpad outperforms my n7 2013 and destroys the ellipsis 8. I have all 3 tablets through verizon. I dunno. In my opinion the gpad 8.3 looks very premium with its brushed aluminum. I keep it out of the case. The standard G Pad 8.3 is nice, but what happened to those LG claims they would bring the new Optimus UI and its streamlined features to older G products (G2, Pad, etc.)? I'm still waiting on the G3 experience. Dual window certainly would be nice.